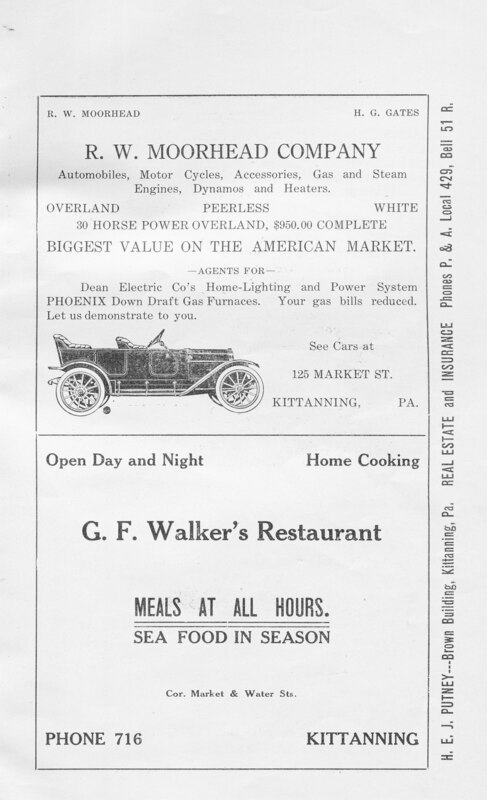 With the population nearing its peak in Kittanning and before corporate restaurants took over, plenty of Kittanning families provided home-cooked meals to the busy downtown area. 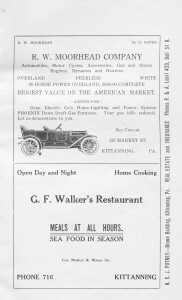 One such place was G. F. Walker’s Restaurant. This would be one of the first business that you would’ve seen as you came across the Kittanning Bridge. 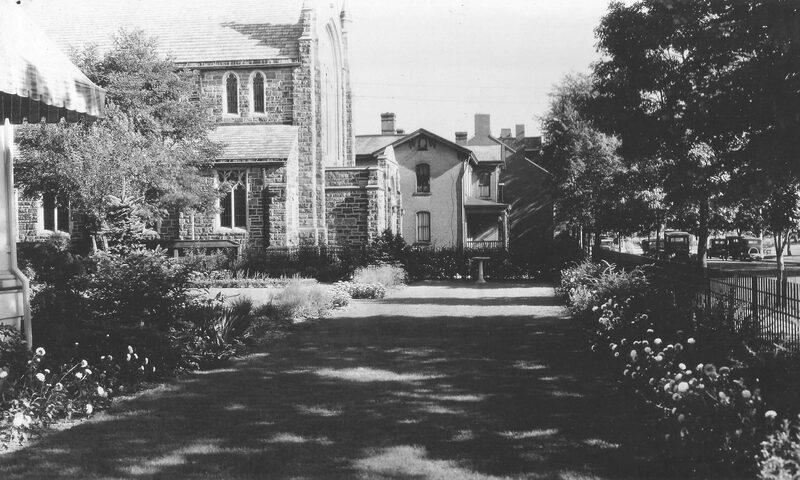 It was located at the current location of Allegheny Real Estate on the corner of Market and South Water St. 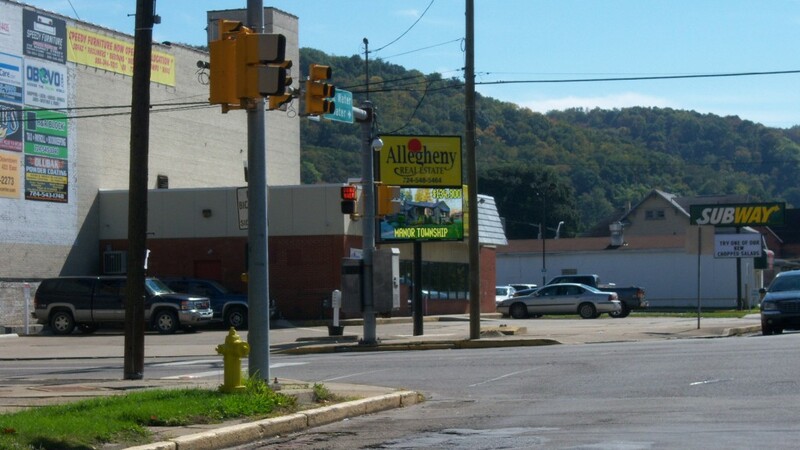 The angled door entrance would have been right on the corner of the sidewalks at Markets and S. Water Street as shown below where the Allegheny Real Estate sign is located. Having several occupations during his lifetime, George F. Walker was born in Skyesville, PA in 1871. 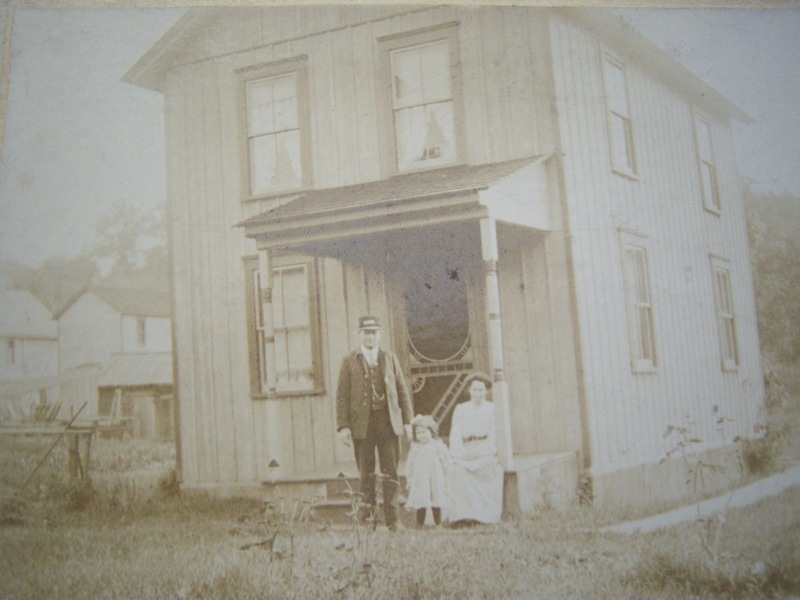 From around 1900 till 1910 he worked for the Kittanning and Leechburg Railway Company in Kittanning which was established around 1890. The trolley would have run in front of his Orr Ave. residence. 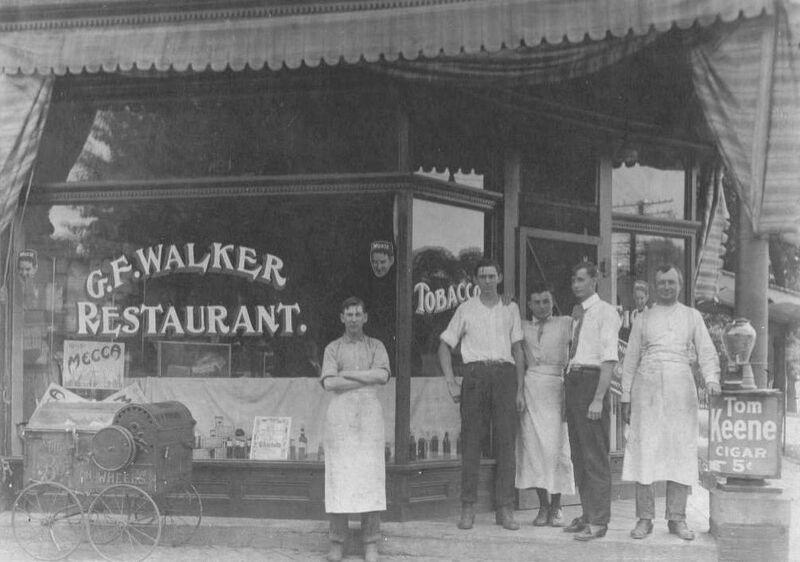 George F. Walker’s brother-in-law prior to 1900 established a Cafe. Alvin George was the owner of George’s Cafe, at that time located at Market and South Mckean Street about 2 blocks away the current location of Dizzy Lizzies. Did Alvin George have an influence, or did his Alvin’s wife Mary? Mary (Walker) George was the sister of George F. Walker and was also running George’s Bakery besides her husband Alvin running the Cafe. This was in the same block as G. F. Walker’s Restaurant on Market Street. You would have to be sure that the George’s expertise would have been of a great assistance in starting a new venture. No doubt the Restaurant would have been short lived, as the fire of 1915 at the Eagle House Hotel placed the building out of commission. A mystery remained if the G. F. Walker Restaurant actually was located at this place due to the fact that early photos don’t show the angled corner of the Eagle House building, only a square enclosed corner. But, a large panoramic photo commonly on display shows that it was likely. A small portion of the photo zoomed in shows a glass structure on this corner. The photo also appears to show a possible damaged roof, but no conclusion of how much it burnt at that time is known. There are newspaper articles that stated the structure remained intact for a few years, to what degree is unknown. At some point George F. Walker then moved to Applewold and continued to live the remainder of his life, becoming Superintendent 0f Water and Streets in Applewold Borough. 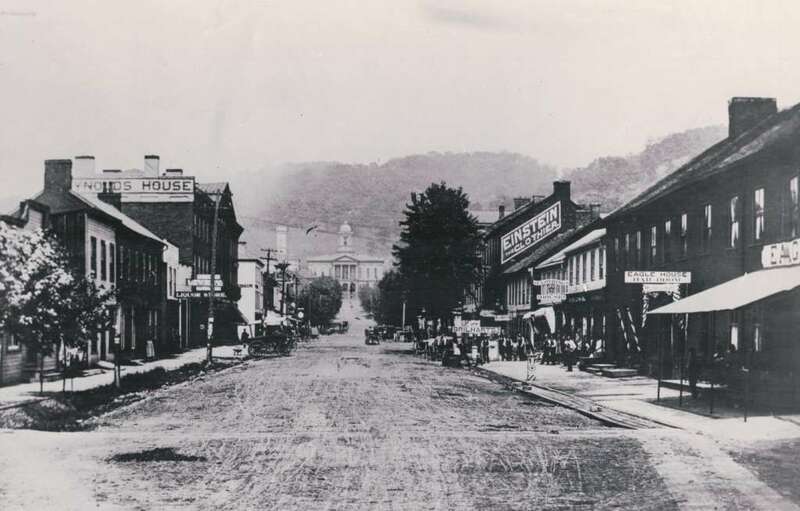 During the early late 1800’s till 1915 the Eagle House Hotel was located here. It had the advantage of sitting next to the river, which would have been ideal as riverboat traffic arrived frequently. 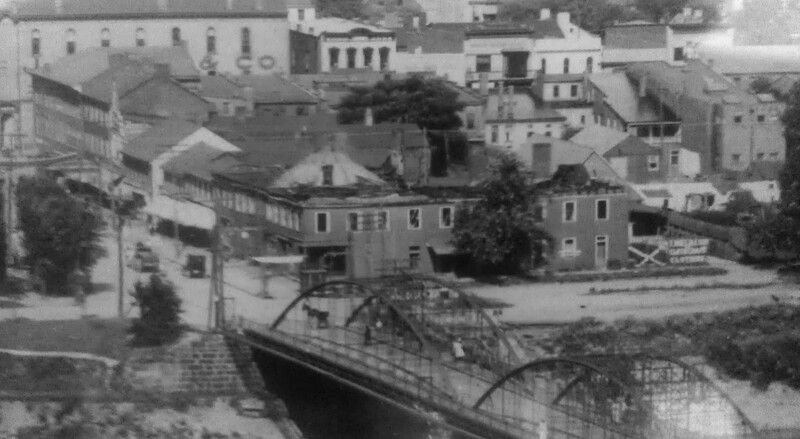 This was a very large structure that took up nearly the entire half-block of the block of 100 Market St from Water Street to Water Alley. As stated, the building was taken by fire and never was to be in operation again. Most of the structure remained for several years, but plans to rebuild and/or to revise it never came to fruition. Here are some photos of the Eagle House Hotel in it’s heyday and after removal of the structure.